We wanted our last days in Scotland to be spent exploring the stunning country. Scotland has so much to offer, and since none of us know when we’ll be able to make it back, we wanted to make the most of it.With that in mind, we checked out of our Airbnb and hit the open road to travel around the North Coast 500! The North Coast 500 was created in 2014, in an effort to bring more tourism to the northern Highlands, and has been promoted as “Scotland’s answer to Route 66”. I have yet to drive along Route 66 (it’s on my rather long travel dream list! ), but the North Coast 500 could definitely give it a run for its money! Although 500 miles isn’t a particularly long drive, we decided to space it out over 3 days. We wanted the ability to stop wherever we wanted for as long as we wanted. A tip – book your accommodation in advance! Our original plan was to just drive over three days and find places to stay along the way. A few months out from our trip, we realized how busy each location’s hotels were. For our drive, we chose counter-clockwise. I don’t have any particular reasoning behind why we chose this, but we all felt it was the right call. Our first day consisted of driving from our Airbnb (Stirling) to the start of the North Coast 500 (Inverness), and up the east coast to Thurso! Seeing the Highlands was something I had been dreaming of for years. If you enjoy road trips full of gazing out the windows at mountains and lochs, then this drive is the one for you! Our drive continued up to the far northeastern corner of mainland Scotland. When I was first plotting out our drive, I made the mistake of thinking John O’Groats was the most northern point of mainland Scotland, and I insisted we go there. Only afterwards, did I learn that Dunnet’s Head is in fact the most northern point. Unfortunately, by the time we were leaving John O’Groats it was nearing dark and the weather was taking a turn for the worst, and my mom and sister both vetoed the detour to the end of Dunnet’s Head. Still, being able to stand beside the John O’Groats sign, as far north as I’ve ever been in the world, felt pretty awesome. It was disappointing to look out the window and see Dunnet’s Head as we drove past (picture below), but that just means it’s a good thing to keep on my list for my next eventual visit! By the time we arrived in Thurso, we were pretty wiped from spending the day driving, and the weather had turned so nasty that we were unable to walk around and explore the town of Thurso. Even so, the views of the day were more than enough! 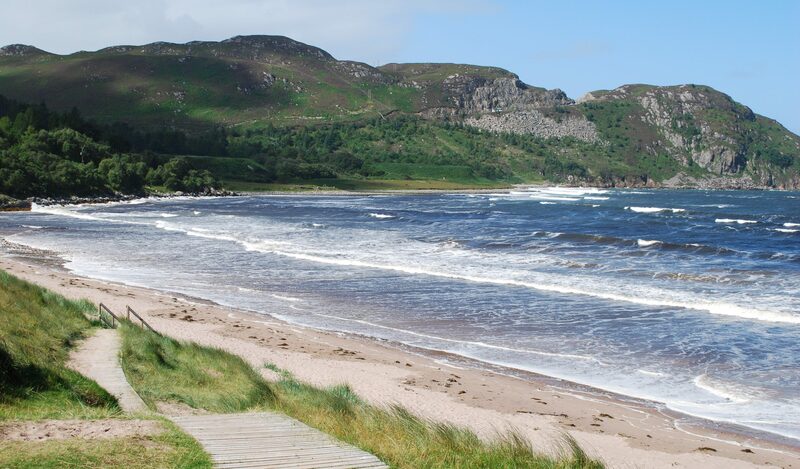 Have you driven the North Coast 500? Which direction did you drive in?